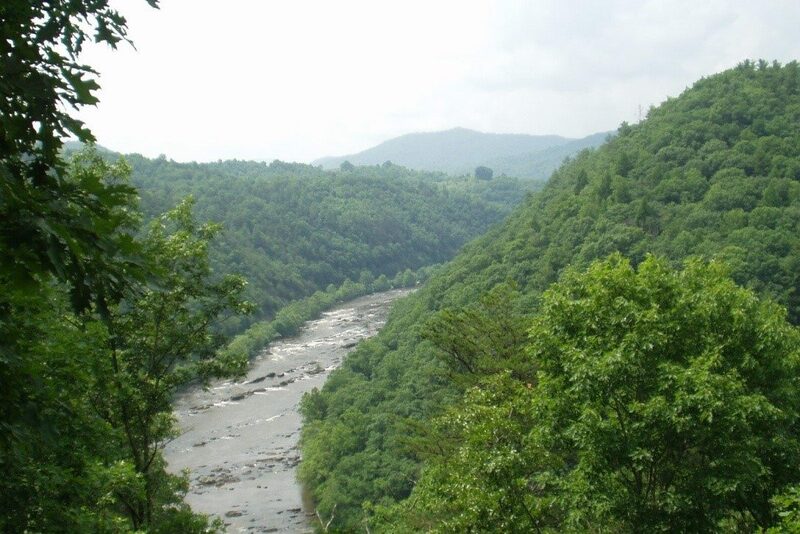 French Broad Crossing encompasses 753 acres nestled within the Appalachian Mountains in Madison County, North Carolina and sits along the French Broad River – the third oldest river in the world. The area offers a staggeringly rich level of biodiversity. The number of native tree species present is equal to the number of native tree species said to occur in all of Europe combined. Plant communities include some that are recognized as threatened or rare. The property has pristine streams and supports a wildlife habitat for black bears, bobcats, gray foxes, wild turkey, barred owls, and groundhogs, among many others. The area also serves as a flyway for bird migration, home to such bird species as the red eyed vireo and the black-and-white warbler. Important natural features of the property include rock cliffs and unique “micro-gorges.” The highly unusual “micro-gorge” features occur within two separate sections of the property, along the creek. Humidity is likely increased in these areas, creating an uncommon habitat for species associated with high humidity. French Broad Crossing was acquired in 2002 by investors who came together in a real estate partnership to develop a private residential subdivision. To recoup and maximize their investments, they faced significant financial incentive to fully develop the property and to sell as many private lots as possible. The investors were keenly aware of the area’s unique ecological significance. However, as much as they hoped to respect the surrounding environment and build a small community that was minimally disruptive, the financial pressures were immense and did not necessarily support environmental conservation. The group of investors who owned the property learned of an economically sound, third way forward. They hoped this way forward would also allow for responsible development, while preserving much of the natural environment in and around French Broad Crossing. The investors learned of tax incentives that would allow them to obtain economic benefits while minimally disrupting a sensitive ecological area: as development in some areas moves forward, economic incentives exist for environmentally-minded property owners to also set aside conservation easements. These easements could include large swaths of land for permanent conservation, rather than allowing the land to be exploited for development. Specifically, property owners grant conservation easements by donating an interest in land with the guarantee it will never be developed. In return for this permanent commitment, the donors can apply tax deductions under Section 170(h) of the U.S. tax code. This is a win-win-win situation: the land owner is compensated for preserving ecologically sensitive areas. Land trusts are provided the resources to protect the land in perpetuity. Best of all, the land itself remains undeveloped so that the natural environment is preserved and plants, aquatic life, birds and animals continue to flourish. This win-win-win solution resulted at French Broad Crossing thanks to an agreement between the original investors and the Smokey Mountain Land Trust. In 2004, the property owners donated a conservation easement on approximately 194 acres to the Land Trust, specifically to be “conserved, maintained and preserved as a conservation area” in perpetuity. In conserving the 194 acres, the investors gave up 75 lots, keeping only 18 lots for future development. The 91 lots had an average value of $118,407 per lot before the donation of the conservation easement. After conserving the 194 acres, the remaining 18 lots were valued at $164,062 per lot (reflecting a 38% enhancement premium due to proximity to the newly created conservation area). The resulting qualified appraisal valued the 75 lots given up in the conservation easement at $5,290,000 using the widely-accepted subdivision methodology as discussed in the IRS Conservation Easement Audit Technique Guide. The investors’ basis in property was $1,590,000. The 18 lots, which were valued in total at $2,160,000 by the appraiser, subsequently sold for values in excess of this amount and the net proceeds were distributed to investors. Today, thanks to the Smokey Mountain Land Trust, a large swath of French Broad Crossing remains undeveloped. Industrial, agricultural and residential use is forevermore prohibited in this unique and ecologically vital conservation area. Southern Living selected French Broad Crossing as one of their premier Inspired Living communities because of the breathtaking one-of-a-kind location that remains in harmony with the natural environment. The related conservation trust was vital to minimize impacts on the donated lands and resident plants, aquatic life and animals – preserving this legacy location and ensuring it remains in accord with nature for generations to come. This is a win-win-win situation: the land owner is compensated for preserving ecologically sensitive areas. Land trusts are provided the resources to protect the land in perpetuity. Best of all, the land itself remains undeveloped so that the natural environment is preserved and plants, aquatic life, birds and animals continue to flourish.